There are two types of garage door springs - torsion and extension. The torsion spring is placed just above the closed garage door and extension springs are placed above the tracks of the door on both sides. These springs are tightly wound, subjecting them to a lot of tension. This tension can cause them to break at times. Lubricating the springs regularly is a good way to maintain their safety – however if they have already broken or look like they have worn significantly, you should call in a professional. It can be very dangerous to try and repair them by yourself. 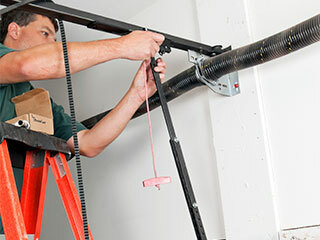 In addition to garage door springs, there are other moving parts in the system that could do with regular lubrication. You can use white lithium grease or silicone spray to lubricate the door opener's screw or chain, hinges, stems, metal rollers, ball bearings and other moving parts. Regular lubrication of these parts also reduces the squeaking noise. Weather seals are a great way to protect garage doors from weather triggered damage as they help keep moisture out of the garage, leaving it dry and clean. Depending on the climate you live in, weather seals can make a significant difference to the life of your door. Weather seals can be applied to the bottom portion of the door, to its frame and in between the panels to provide complete protection. Door won't close all the way – this could indicate a problem with the opener safety sensors which can be very dangerous. Noisier door – If your door has suddenly become much so noisy that it is disturbing you at home, this can be a sign that the motor in your opener is failing – you'll need an expert to help you out with this. Wonky door – If your door is shaking a lot when moving or appears uneven, it is likely that your tracks have become misaligned. Considering the weight of your garage door, this can become a serious issue fairly quickly if not looked at and repaired by a professional. From cleaning tracks to repairing broken springs, our professionals can help you without burning a hole in your pocket. If your garage door system is new, you may wish to consider booking routine maintenance visits with us to ensure your unit lives as long as it should. For more information, contact us at Garage Door Repair Lake Zurich today – we'll be happy to talk to you!